The peninsula of Setúbal, together with the peninsula of Tróia, acquired great prestige and importance in the last decades of the twentieth century. The region becoming a prime tourist destination thanks to the protected nature of the National Parks of Arrábida and Marinho D.Luis Saldanha, the Natural Reserve of Sado Estuary, the Protected Landscape of Arriba Fóssil da Caparica, to excellent tourist infrastructures and heritage buildings, also rich in diversity and historical importance. It´s ongoing the recognition of Arrábida as Natural and Cultural Heritage of Mankind. The wine tourism product gained equal importance. The cultures of the vine and of the wine have been able to integrate and have adapted to these new times, being nowadays unanimously recognized as a strategic resource and of great quality in the region. From the large farms dominated by the variety Castelão to the Moscatel, one of the national dessert wines, this region has always played a leading role in the history of Portuguese wines. Farmers in this region have prestigious wines and are winners of numerous international awards, but the recognition comes from old times, since during the Late Middle Ages, between the 12th and 15th centuries, wine has been a main export product in Peninsula de Setúbal, stimulated by the technological advances introduced by the religious orders. In the Peninsula of Setúbal grape seeds were found, dating from the 8th century BC, in recent archaeological excavations, highlighting the ancient culture of the vine, which goes back in the region to a period long before the formation of Portugal. It is estimated that the cultivation of vineyards has entered the valley of the River Sado by the Tartessians, for about 2000 B C.
Other cultures, such as Greeks, Romans and Muslims (despite the Qur’an prohibition to consume alcoholic beverages, local authorities proved to be complacent towards the Christians, authorizing the production and trade of wine) improved the cultivation of vines. The Peninsula of Setúbal presents two types of landscapes. One with vineyards planted on clay-limestone soils, protected by the slopes of Serra da Arrábida, and the other covering flat lands or gently undulating soils composed of sand, poor and perfectly adapted to the production of high quality grapes. The climate is temperate Mediterranean, with hot dry summers and mild and rainy winters. The average annual relative humidity is high due to the proximity of the sea. The Peninsula of Setúbal comprises the Designations of Origin, Palmela and Setúbal and the designation of the regional wines "Peninsula de Setúbal”. The name "Setúbal" is reserved for the wines Moscatel of Setúbal and Moscatel Roxo. 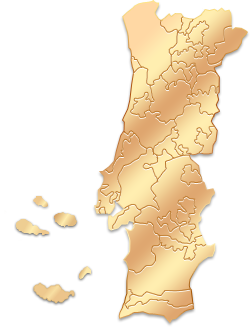 Most of the wines of the region use the variety Castelão (known in the region of the Peninsula of Setubal by Periquita) in its composition. This is the traditional variety of the region and the legislation for the production of wines of Designation of Origin requires the use of a high percentage of the same. The wines of Castelão are structured, with fruity flavours, suggesting cherry, currant, acorn, chestnut, candied plum, blackberry and raspberry aromas, which harmonize well with the stage in oak barrels. As a general rule, they have an excellent aging potential. The white varieties of reference in the region are Arinto, Fernão Pires and Moscatel of Setúbal, which is used in white wines and dessert wines of the Designation of Origin of Setúbal. This wine has unique features due to its floral aromas in the whites and the soft flavours of spices and berries in reds. In red varieties, show up the Alfrocheiro and Trincadeira. The dessert wine of Setúbal, made of the varieties Moscatel and Moscatel Roxo, is one of the oldest and most famous wines in the world. Muscat of Setúbal is a fortified wine of excellent quality, especially when aged for several years in oak barrels. It is a wine with an intense aroma of orange blossoms, honeyed and full-flavoured, which evolves with age for notes of dried fruits, raisins and coffee. Liqueur wines produced in small quantities, made ​​from the Moscatel Roxo with characteristics similar to Moscatel of Setúbal, are thinner and have very complex aromas and flavours of raisins, figs, hazelnuts and bitter orange. The city of Setúbal is the third harbour of the country, after Porto and Lisbon. The old part of the city has roman origins, one of the oldest in Portugal, with many interesting points to visit. Setúbal is also a mandatory stop for those who intend to discover the natural reserve of the Sado estuary. Placed in one of the last promontories of the city of Arrábida, Palmela is topped by the impressive castle–citadel. Strategic location between the estuaries of Tejo and Sado, it offers a magnificent view of Setúbal, behind the peninsula of Troia and west of Serra da Arrábida. One of the gastronomic specialities of Palmela is the pear cooked in wine Moscatel. Setúbal is a starting point to explore the region. South of the central gardens and fountains is the marine, fishing harbour and ferries. North of the gardens is the old part of the city, with nice streets and squares, full of shops and cafes. We recommend a visit to the Cathedral of the 16th century, the Museum of Archaeology and Ethnography, the Castle of São Filipe and the Natural Reserve of the Sado estuary. The magnificent castle of Palmela, rises in the foothills of Arrábida Mountain. In days of clear sky you can even catch a sight of Lisbon. We recommend a visit to the Church Convent of Santiago, the Church of São Pedro and the annual wine festival in the first weekend of September, in front of the Town Hall of the 17th century. Praça Estação do Quebedo (north zone of the old part of the city), from Lisbon, take the ferry up to Barreiro Station / Bus station, Avenida 5 de Outubro, +351265525051. More info. : www.cp.pt. Estação Rodoviária, Avenida 5 de Outubro, +351 265 525051. Azeitão: From the city of Porto, take the A1/Lisboa, take the 1st exit onto A12 South towards P.te V. Gama, take exit 3 to merge onto A33 / IC32 towards Montijo / Barreiro and exit onto Av. 10 Junho.Azeitão. From Lisbon, take the A2/IP7 connect to N10 / N378 towards Sesimbra / Azeitão. Comporta: From the city of Porto, take the A1/Lisboa, take the exit towards A10 Benavente / Algarve, follow signs for A13 / Algarve / A2 / A6 / A12 and turn onto A13, follow signs for A2 / Algarve / Alcácer and turn to A2, take exit 8 to converge with IC1 / N5, converge with N253 and turn to N253- 1 direction Comporta. From Lisbon, take the A2/IP7, the A2 take exit 8 to merge onto IC1 / N5, merge onto N253 and N253-turn to the 1 direction behaves. Tourism region of Costa Azul, Travessa Frei Gaspar, +351 265 539120 / Arrábida Natural Park, Praça da República, +351 265 541140 / Inside the castle walls, +351 212 332122.